War Diary account of the 7th LHR, AIF. Regiment moved out of camp at 1700 as Advance Guard to Brigade. 4 Other Ranks evacuated to hospital. Arrived Cross roads 4 miles West of Arara at 0030. At Bir Arara at 0200 halting till Brigade arrived at 0400. Moving forward the in the direction of Bir el Hamam (Square E7). Enemy outpost occupying Hill 1390 1 mile south West Hamam, fired on screen and NZMR Brigade. Regiment occupied line Hill 1220 to Hill 1150 1 1/2 miles North of Hamam at 0700, halting till 0930. Moving from this position to occupy a line Bir Sakaty (Square E6) to position of these roads due South of "EL" in Tel el Sakaty astride the Beersheba Hebron Road. 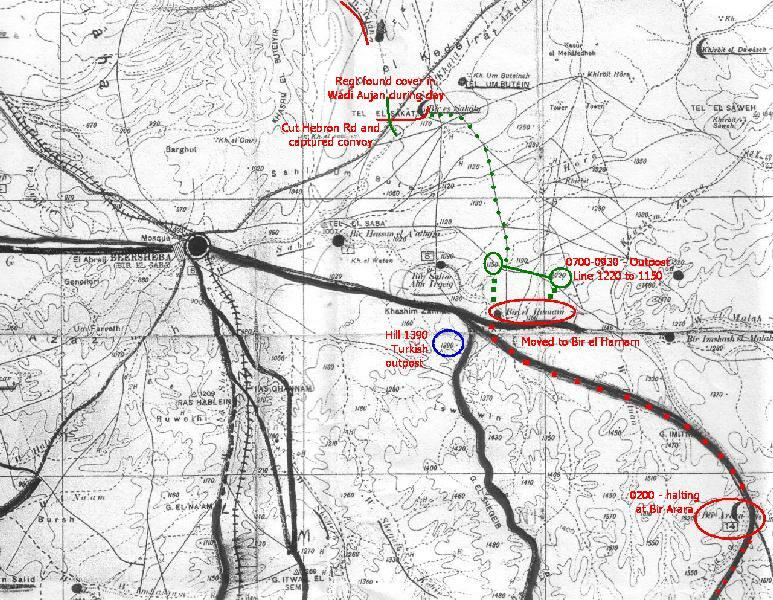 On covering half the distance the Regiment was ordered to push on rapidly to capture Turkish Convoy and cut Hebron road. Convoy of 10 waggons, 8 horses and 2 mules captured. Regiment came under heavy shell fire at point blank range just south of the Hebron Road. Good cover was found in the Wadi Aujan where the Regiment remained till evening. 39 Prisoners being captured by one section in this Wadi under 207 Corporal Edward Benjamin Picton. Regiment withdrew at 1800 to position 1 mile South bivouacking for the night. 5th LH Regiment on the right. One Squadron being sent at a time to water at Bir el Hamam. Total number of prisoners captured during the day was 49. 2 men injured and 1 wounded in action, wounded to hospital.